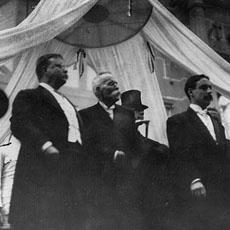 Theodore Roosevelt became president of the United States at the beginning of the nineteen hundreds. He firmly believed in expanding American power in the world. To do this, he wanted a strong navy. And he wanted a waterway that would let the navy sail quickly between the Atlantic and Pacific oceans. Roosevelt decided to build that waterway. This week in our series, Richard Rael and Maurice Joyce tell the story of the Panama Canal. RICHARD RAEL: For many years, people had dreamed of building a canal across Central America to link the Atlantic and Pacific Oceans. The most likely place was at the thinnest point of land: Panama. Another possible place was to the north: Nicaragua. President Roosevelt appointed a committee to decide which place would be better. Engineers said it would cost less to complete a canal that had been started in the eighteen eighties in Panama. But, the United States would have to buy the land and building rights from a French company. The price was high: more than one hundred million dollars. So, the committee decided it would be less costly, overall, to build a canal in Nicaragua. The proposal went to the United States Congress for approval. 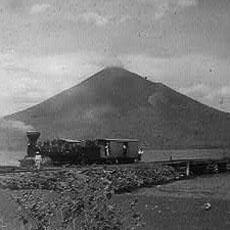 MAURICE JOYCE: The House of Representatives quickly passed a bill to build the Nicaragua canal. Then the French company reduced its price for the land and building rights in Panama. It decided some money was better than no money at all. President Roosevelt was pleased. He gave his support to the Panama plan. When the Senate began debate, however, it appeared the Nicaragua plan would win. Then a volcano exploded in the Caribbean area. A city was destroyed. Thirty-thousand people were killed. Soon, reports said another volcano had become active and was threatening a town. The volcano was in Nicaragua. Nicaragua's president denied there were any active volcanoes in his country. But one of Nicaragua's postal stamps showed a picture of an exploding volcano. That little stamp weakened support for the Nicaragua canal. The Senate passed a bill for a Panama canal instead. The House of Representatives changed its earlier decision. It approved the Senate bill. RICHARD RAEL: At that time, Panama was a state of Colombia. Canal negotiations between America and Colombia did not go smoothly. After nine months, the United States threatened to end the talks and begin negotiations with Nicaragua. The threat worked. 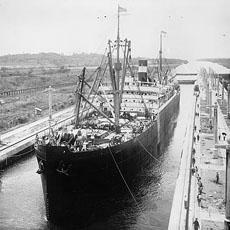 In January nineteen-oh-three, Colombia signed a treaty to permit the United States to build the Panama Canal. The treaty gave the United States a canal zone. This was a piece of land ten kilometers wide across Panama. The United States could use the canal zone for one hundred years. In exchange, it would pay Colombia ten million dollars, plus two hundred fifty thousand dollars a year. The United States Senate passed the treaty within two months. The Colombian Senate rejected it. The Colombian government demanded more money. MAURICE JOYCE: President Roosevelt was furious. He saw the issue in terms of world politics, not simply Colombia's sovereignty. He said: "I do not think Colombia should be permitted to bar permanently one of the future highways of civilization." Roosevelt was ready to take over Panama to build the canal. That was not necessary. A revolt was being planned in Panama to gain independence from Colombia. The United States made no promises to support the rebels. But it wanted the rebels to succeed. Under an old treaty, Colombia had given the United States the right to prevent interference with travel across Panama. Now, the United States used the old treaty to prevent interference from Colombian troops. Several American warships were sent to Panama. RICHARD RAEL: The local leader of the Panamanian revolt was Manuel Amador. Amador had the support of the French company that still owned the rights to build the Panama Canal. The chief representative of the company was Philippe Bunau-Varilla. He worked closely with an American lawyer, William Cromwell. Bunau-Varilla and Cromwell provided Manuel Amador with a declaration of independence, a constitution, and money. Amador used the money to buy the support of the Colombian military commander in Panama City, the capital. He also got the support of the governor, who agreed to let himself be arrested on the day of the revolt. 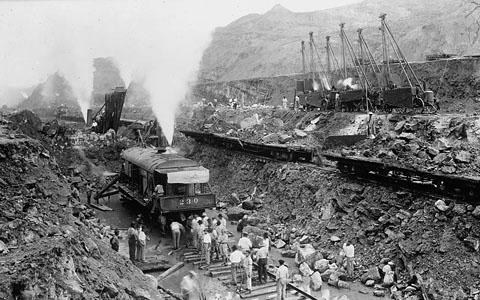 Amador formed a small army of railroad workers and fire fighters. The rebel army planned to take over Panama City on November fourth, nineteen-oh-three. Just before that date, five hundred Colombian soldiers landed at Colon, eighty kilometers away. The soldiers could not get to Panama City, however. All but one railroad car had been moved to the capital. "Yesterday, we were slaves of Colombia. Today, we are free. President Theodore Roosevelt has kept his word. Long live the Republic of Panama! Long live President Roosevelt!" Colombia asked the United States to help it re-gain control of Panama. The United States refused. It said it would oppose any attempt by Colombia to send more forces there. The United States also recognized Panama's independence. And, almost immediately, it started negotiations with the new government on a canal treaty. RICHARD RAEL: The two sides reached agreement quickly. The treaty was almost the same as the one the Colombian Senate had rejected earlier. This time, however, the canal zone would be sixteen kilometers wide, instead of ten. And the United States would get permanent control of the canal zone. The treaty was signed on November eighteenth, nineteen-oh-three. That was just fifteen days after Panama declared its independence. MAURICE JOYCE: Colombia protested. It said the United States had acted illegally in Panama. Many American citizens protested, too. They called President Roosevelt a pirate. They said he had acted shamefully. Some members of Congress questioned the administration's deal with the French canal company in Panama. Several investigations examined the deal. Theodore Roosevelt did not care. He was proud of his success in getting the canal started. He said: "I took the canal zone and let Congress debate. And while the debate goes on, so does work on the canal." RICHARD RAEL: It took ten years for the United States to complete the Panama Canal. The first ship passed through it in August, nineteen fourteen. In that same year, the United States signed an agreement with Colombia. The agreement expressed America's regret for its part in the Panamanian revolution. And it provided a payment of twenty-five million dollars to Colombia. Theodore Roosevelt was no longer president when the agreement was signed. But he still had many friends in the Senate. He got them to reject it. After Roosevelt's death, the United States signed another agreement with Colombia. The new agreement included the payment of twenty-five million dollars. It did not include the statement of regret. The Senate approved the new agreement. MAURICE JOYCE: The issue of America's involvement in Panama caused much bitterness in other countries of Latin America. Some did not feel safe from American interference. President Roosevelt said the United States would not interfere with any nation that kept order and paid what it owed. Roosevelt was worried because some Latin American countries were having difficulty re-paying loans from European banks. He did not want the issue of non-payment used as an excuse for European countries to seize new territory in the western hemisphere. Roosevelt said the United States was responsible for making sure the debts were paid. His policy led to further United States involvement in Latin America. BOB DOUGHTY: Our program was written by Frank Beardsley. The narrators were Richard Rael and Maurice Joyce. You can find our series online with transcripts, MP3s, podcasts and images at www.unsv.com. You can also follow us on Facebook and Twitter at VOA Learning English. Join us again next week for THE MAKING OF A NATION -- an American history series in VOA Special English.